The other day a neighbour of ours has a bonfire in his backyard. He was doing nothing wrong and the fire was in a fire pit and everything. But the smell of the smoke made all of us stand up and look around to make SURE there wasn't another massive forest fire happening. It is often simple things that bring back the memories - the smell of smoke or an especially red/orange sunset for example. We drive by trees that were burnt every day on our way to and from school. And if you drive through town you can still see the remains of homes that were burnt to the ground. 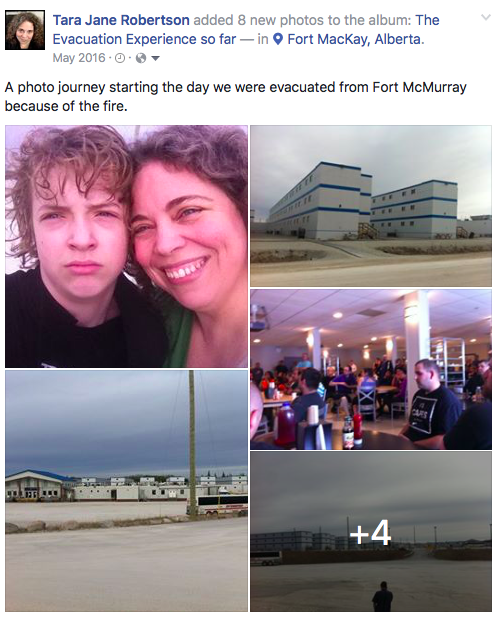 Fort McMurray is still recovering and so are we. 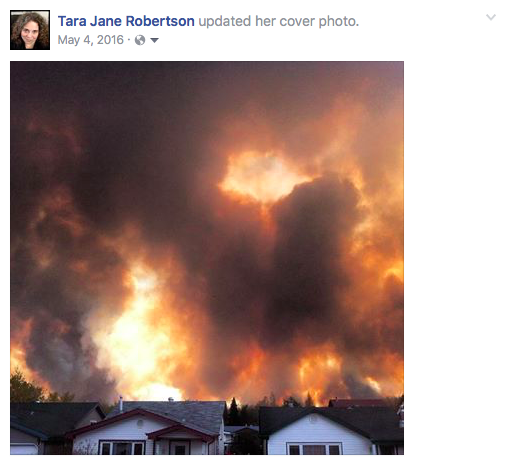 One of the ways I have been processing is by going through my social media posts from the days of the fire and evacuation. 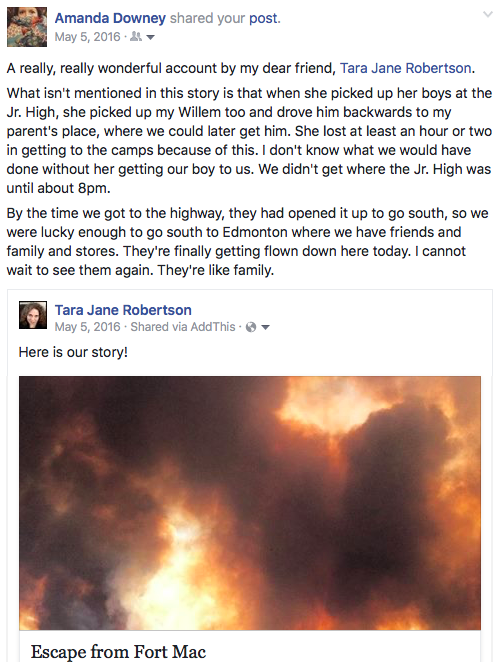 You can read the first part in my post from yesterday but here are the posts starting from the morning after the evacuation. It is hard to describe just how thankful we felt to be safe and together. I cried when we were able to pick Doug up on the side of the highway and even the next morning it was so comforting just to SEE my children and my husband and even my cat in the same room with me. 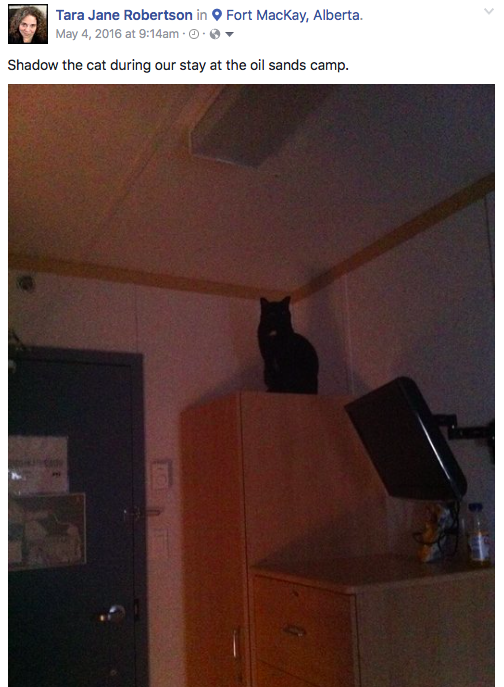 Shadow has a particularly miserable time I must admit. When I left I just picked him up and put him in the van. I didn't grab food or water or a litter box or a pet carrier... just him. The camp didn't have pet supplies so we gathered gravel from the parking lot to use as a litter box and offered him a variety of "people" food. He was not impressed. 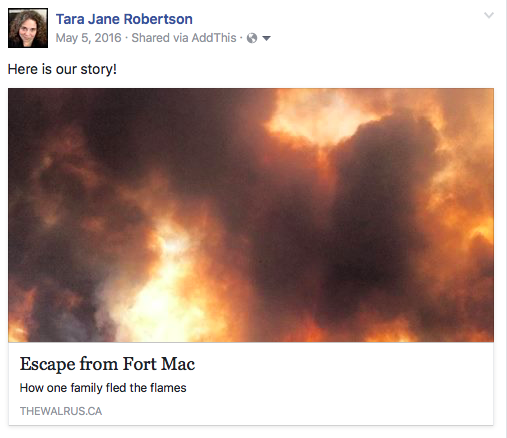 The fire was never far from our minds. We listened constantly to the news and could smell the smoke. The kids were a mess so we tried to keep things as light as possible. We spent a lot of time reassuring them that stuff could be replaced and even if our house burned down we would be ok.
We were shocked by the care we received both from people in the camps and from friends around the country. We felt loved and supported and it meant so much. It was a huge relief to be able to go to Edmonton. There is only so long you can go without a change of clothes before everyone starts to get grumpy. Our first morning at the camp I got an email from someone asking for an interview. I was very tired and very scattered but said sure so she called me on my cell phone. That night she sent me a link to a story. It was completely surreal. 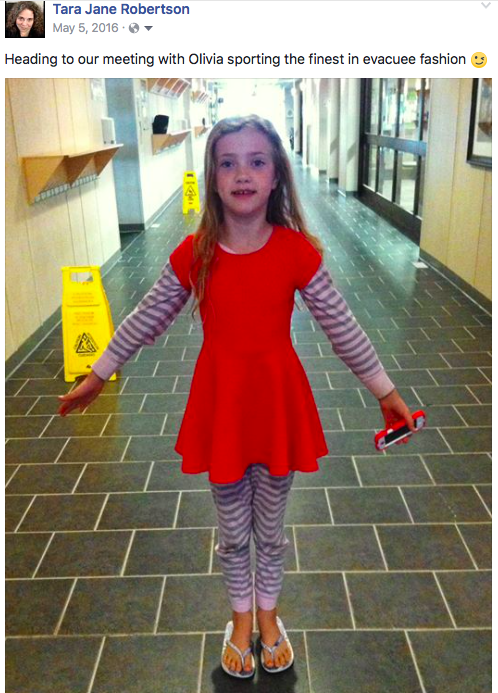 My best friend Amanda and her family had been evacuated South to Edmonton and we were so relieved to be back together. Just being in the same place, seeing each other and knowing our families were safe really helped our mental well being. We were incredibly happy to be in Edmonton with my cousins. There is just nothing like family during a time of crisis. And they were so very generous. It was just a huge massive relief. I don't have the words to describe it. When we were evacuated we were broke. We had less than $100 in our bank account and within a couple hours my friend Shannon had set up a gofundme campaign for us. I can't even begin to describe how much the financial support of people all around the country helped us. I don't know what we would have done without it. The money from others quite literally supported us for several months until things returned to normal.